That image above, resembling a subway map, is an imaginative visualization of the World Wide Web in 2007.1 The company that created this graphic, the design firm Information Architects, stopped updating it in 2011. The Web has lost its spirit. The Web is no longer a distributed Web. It is, ironically, a couple of big tubes that belong to a handful of companies. Mainly Google (search), Facebook (social) and Amazon (e-commerce). There is an impressive Chinese line and there are some local players in Russia, Japan, here and there. Overall it has become monotonous and dull. How can we fix that, and bring back at least some of that spirit? The folks at iA suggest we need more bloggers, those who used to write online and those new to the concept. If you are one of those old or young bloggers, please join in. Drop Facebook, drop Twitter and drop Medium for original thought. Own your traffic. You can use them to engage in discussion. But don’t get lost in there. Write daily. Publish as often as you have something to say. Link to other blogs. Completely agree. I would especially love to see more teachers online, posting content to their own domains instead of to Facebook, Instagram, Twitter, and the other closed tubes. Creating communities of educators that own and control their message. Instead of producing material for greater advertising sales. Thanks to Doug Belshaw for the link that triggered this rant. He includes lots of interesting links like that in his free weekly newsletter, Thought Shrapnel. 1. Click the image to see a larger, more readable version. Techie and long time writer Tim Bray wants you to know he’s still blogging in 2017. Publishing in his own space in this age of massive media platforms. Not alone and not un­read, but the ground un­der­foot ain’t steady. An in­stance of Ho­mo eco­nomi­cus wouldn’t be do­ing this ?— ?no pay­day loom­ing. So I guess I’m not one of those. But hey, when­ev­er I can steal an hour I can send the world what­ev­er words and pic­tures oc­cu­py my mind and lap­top. Which, all these years lat­er, still feels like im­mense priv­i­lege. Not sure I would use the word privilege, but I can’t think of anything better, so let’s go with that. I certainly feel grateful that anyone besides me reads this stuff. So, where is this blogging stuff going (and maybe we need a new term for that as well)? I won­der what the Web will be like when we’re a cou­ple more gen­er­a­tions in? I’m pret­ty sure that as long as it re­mains easy to fill a lit­tle bit of the great names­pace with your words and pic­tures, peo­ple will. I hope so. It’s fun being able to add my ideas to the great mix. And I enjoy reading the wide variety of thought bits contributed by others who still write in their own spaces. I’m also “still op­ti­mistic about what­ev­er this thing is I’m do­ing here”. 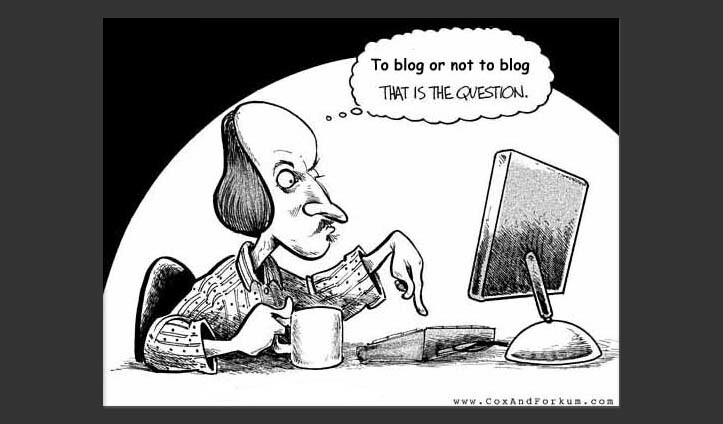 Returning to the idea of a domain of one’s own, I ran across a post from long time blogger Andy Baio who mourns the “decline of independent blogging”, but still believes “they’re still worth fighting for”. Ultimately, it comes down to two things: ownership and control. Here, I control my words. Nobody can shut this site down, run annoying ads on it, or sell it to a phone company. Nobody can tell me what I can or can’t say, and I have complete control over the way it’s displayed. Nobody except me can change the URL structure, breaking 14 years of links to content on the web. Ok, so none of us own a domain – we only rent it. And few people own the web server that distributes their work. But by blogging at our own domain – outside of corporate platforms like Facebook, Tumblr (Verizon, by way of Yahoo), and Blogger (Google) – we still own and control our ideas and how they are first presented to the world. Echoing Andy’s desire to see more independent bloggers, I firmly believe more educators should be posting out there on the open web. On their own domains. Telling the world what’s going on in their classrooms, schools, and districts (charter companies?). Discussing their ideas about learning. Reflecting on problems standing in their way. Contributing their unique voices to the mix on the web. However, blogging is not enough. We also need to help each other build an audience and build communities around those educators who are willing to share in the open. And, on the other end, to teach our colleagues, parents, and even students why reading blogs is important, where to find the good ones, and how to easily build them into their routines (RSS still lives!). How does that happen? I don’t quite know. Others have tried and largely failed (top 100 lists and trivial awards do not a community make). But I think it’s worth more effort, and I’m open to suggestions. Right now, all of this is just an idea buzzing around my warped little mind. We’ll see if anything develops from it. What If I Want to Write Six Paragraphs? As a math major1Full disclosure: I started as a history major but when I graduated, no one wanted history teachers. Thus the math degree. I know, it makes no sense. who struggled with the formality of my English classes (diagramming sentences is a plot worthy of Dr. Evil), I found much to relate to in this post by an English teacher and published in, of all places, the National Council of Teachers of English blog. The five paragraph essay was a core of my writing instruction from middle school through undergraduate work and I guess it must be still if she’s writing about it in 2016. In case you’ve forgotten (I had to look it up), this is a strictly-enforced writing structure consisting of an introductory paragraph, three paragraphs to support and develop your idea (never more than one idea! ), and a concluding summary paragraph. Tell ‘em what you’re going to say, say it, tell ‘em what you said. I always suspected it was an artificial school construct since I rarely saw the form used in the real world. So let’s just cut through the first two parts of her essay and jump to the last paragraph. In conclusion, the five-paragraph essay is an effective way to remove all color and joy from this earth. It would be better to eat a flavorless dinner from a partitioned plate than to read or write a five-paragraph essay. It would be better to cut one’s toenails, because at least the repetitive task of clipping toenails results in feet more comfortably suited to sneakers, allowing for greater movement in this world. The five-paragraph essay, by contrast, cuts all mirth and merit and motion from ideas until there is nothing to stand upon at all, leaving reader and writer alike flat on their faces. Such an essay form is the very three-partitioned tombstone of human reason and imagination. Yep, that pretty much summarizes my feelings. Although I produced a lot of written material for my teachers in high school and college, I never really learned to write until I started blogging (we can argue about that “learned to write” part later) and had a good reason to. By that time I had long since forgotten the processes required in those academic courses, as evidenced by the rambling, often poorly thought out posts in this space. However, I wonder how many students actually use the five paragraph essay format after they leave the academic setting. How applicable is it today in a world where so much material is produced for posting online, not for print? But I’m a math major, so English teachers, tell me how wrong I am. Here are the notes for my Ignite talk at the VSTE (Virginia Society for Technology in Education) conference today. You probably don’t need the slides for this to make sense, but if you really want them, leave a comment and I’ll post them. I tried, in five minutes, to explain why educators (or anyone else) should not be posting their creative work to places like Facebook, Instagram (same thing), Pinterest, or other “free” sites. Instead you need your own domain.